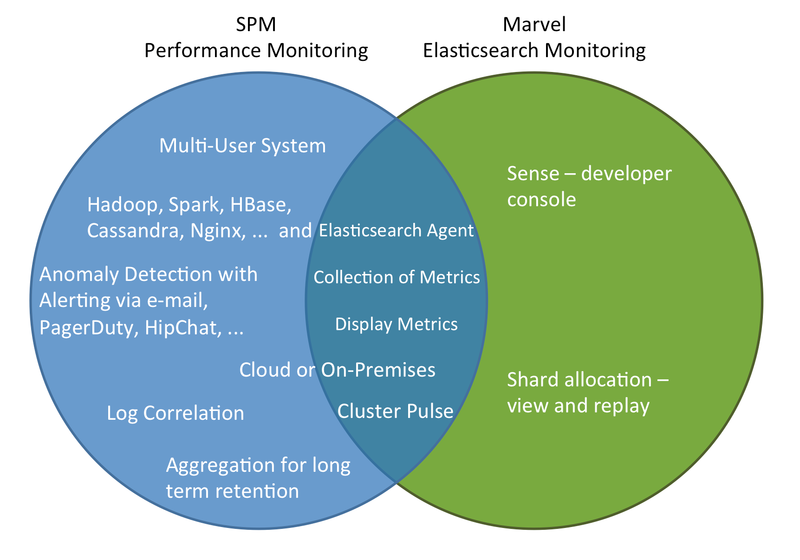 While many SPM Performance Monitoring users quickly see the benefits of SPM and adopt it in their organizations for monitoring — not just for Elasticsearch, but for their complete application stack — some Elasticsearch users evaluate SPM and compare it to Marvel from Elasticsearch. We’ve been asked about SPM vs. Marvel enough times that we decided to put together this focused comparison to show some of the key differences and help individuals and organizations pick the right tool for their needs. Marvel is a relatively young product that provides a detailed visualization of Elasticsearch metrics in a Kibana-based UI. It installs as an Elasticsearch plug-in and includes ‘Sense’ (a developer console), plus a replay functionality for shard allocation history. SPM, on the other hand, offers multiple agent deployment modes, has both Cloud and On Premises versions, includes alerts and anomaly detection, is not limited to Elasticsearch monitoring, integrates with third party services, etc. The following Venn diagram shows key areas that SPM and Marvel have in common and also the areas where they differ. Both have the ability to show metrics from multiple nodes in a single chart: Marvel draws a separate line for each node, while in SPM you can choose to aggregate values or display them separately. The following “SPM vs. Marvel Comparison Table” is a starting point to evaluate monitoring products for organization’s individual needs. Saving Individual Dashboards Each user can store multiple dashboards, mixing charts from all applications, including both metrics and logs. Current view can be saved, reset to defaults possible. These changes are global. Pre-aggregation at multiple granularity levels, including 1 min granularity. Advantage: more efficient storage, scales better, faster for graphing performance over longer time periods at the expense of sub-minute precision. Query-time aggregation. No write or query-time aggregation. Advantage: 10 second precision by default at the expense of storage size, write, and read performance and memory footprint. As an aside, most of the features in this comparison table would also apply if we compared SPM to BigDesk, ElasticHQ, Statsd, Graphite, Ganglia, Nagios, Riemann, and other application-specific monitoring or alerting tools out there. If you have any questions about this comparison or have any feedback, please let us know!